According to recent research by Forbes Insights, 42% of organizations in Asia Pacific consider themselves either advanced or leaders in terms of their digital transformation journey. The region is at a turning point. 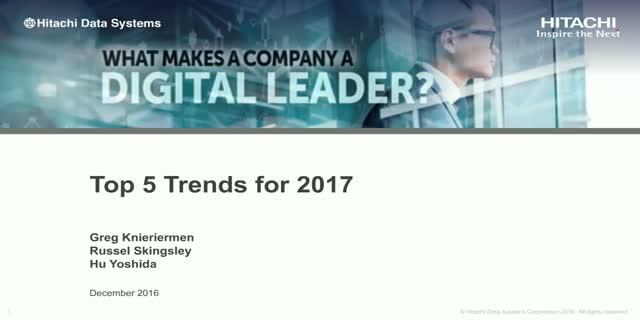 Leaders are disrupting industries and staying ahead because of their digital transformation foresight. Hitachi Data Systems cordially invites you to attend our webcast on Asia Pacific Technology Trends for 2017. Please join the speakers from HDS for this 1 hour webcast to learn how these technology trends enable and accelerate your organization’s digitization.